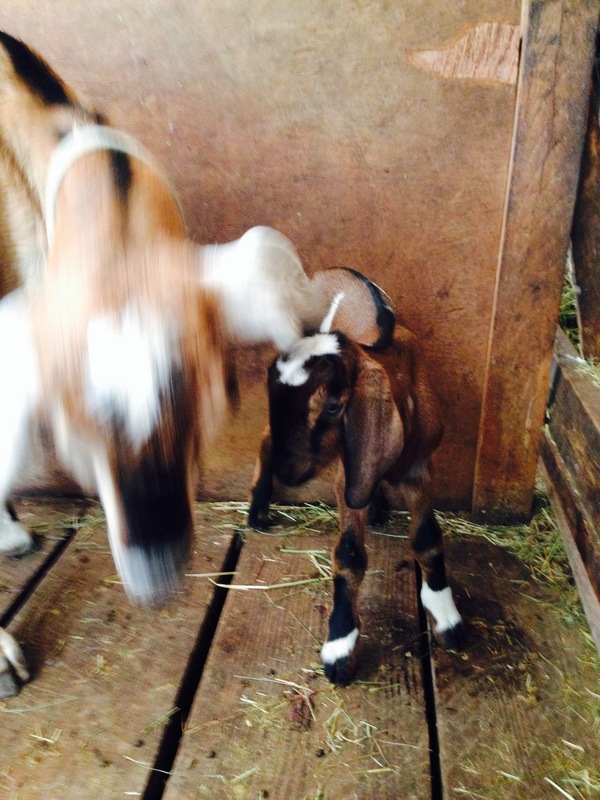 TUCKER'S FARM GOATS CHEESE – Page 2 – It'll bring out the billy in you ! Before we talk cheese, – look who’s back living in Electric Lady Land? O.K. Make Six and it’s six real beauties! It went text book…until it came pressing time and the concrete weights I planned on using proved to be waaaayyy too heavy. The main thing is not to panic, right? So I kept my head and scrambled up some 2 qt. 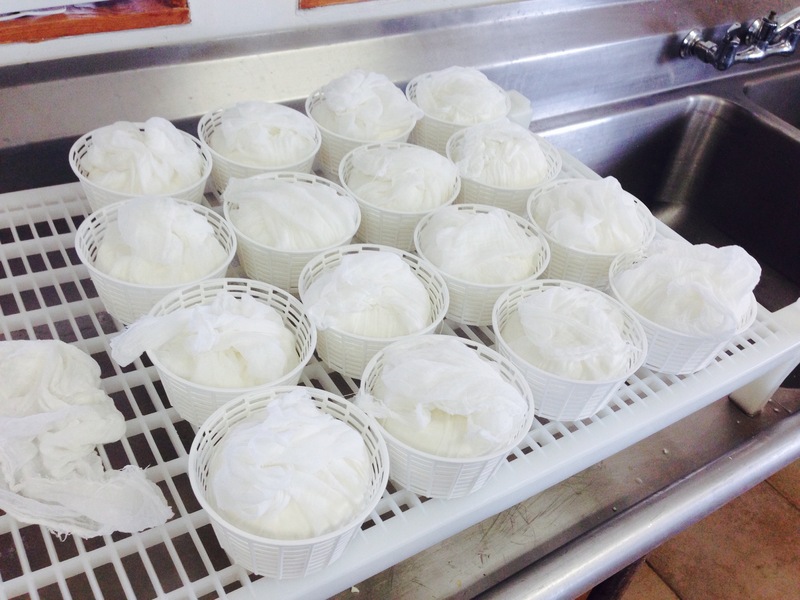 plastic buckets – they fit perfectly on top of the cheeses, but 2 qts. of water only weighs 4 lbs. 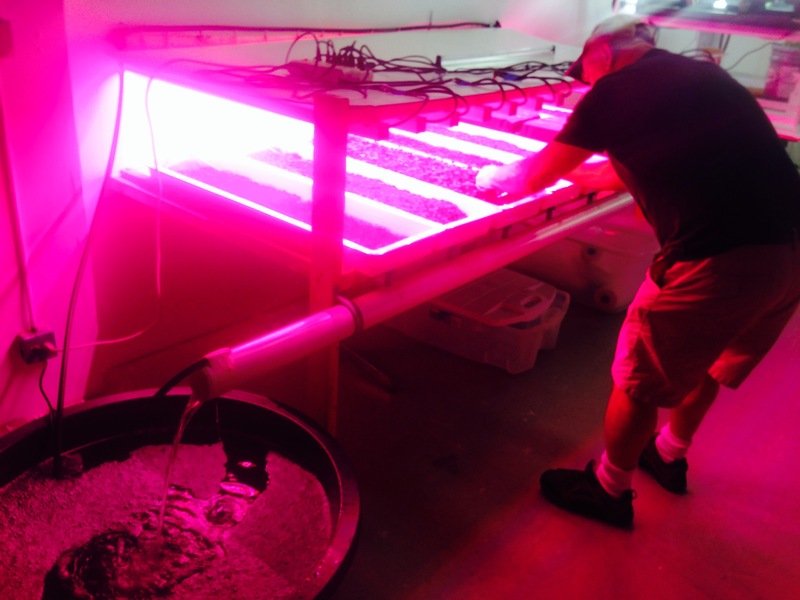 – too light – so I added a five gallon bucket filled with 6 more qts. of water (another 12 lbs.) – o.k., nice. It turns out Necessity (combined with a little panic) really is the Mother of Invention! cheese press – 12 lbs. After a routine of flipping every hour for about 5 hrs., they were left overnight sitting in their molds. This morning I soaked them in a saturated brine for 5 hrs., then popped them into the ripening fridge. But they are just “posers” for now, as it’s all in the ripening with these cheeses – 60 days of 56F and 85-90 RH combined with a healthy dose of love and attention. So 2 will be soaked in vino, 2 coated in Rosemary (especially for my friend Julie!) with some Spice leaves and Surinam cherry leaves and 2 will be rubbed with Coconut Oil (my new favourite oil) – and we’ll just have to see. Stay tuned! For months we had no milk – “Where’s de cheese?” was all I heard. And now all of a sudden we have so much milk we can’t seem to make it quick enough! So it’s Make 5 and here comes the “Kid” – an easy raw goats milk cheese, and just a pleasure to make, with the beautiful pattern of the ricotta molds etched in its surface. After being hand-salted and left to dry for a couple of days, we’ll slip on their little black wax coats so they can begin their 60 days and nights of “dreamland” time. Senor Baja is the last of the last – the “only” – as I’ve given the earlier kids away already. And so that also makes him blessed, as i’ll leave him with his mother – Blessed X2 as he’ll also stay with the herd long term. His journey into this world was destined to be fraught with danger. 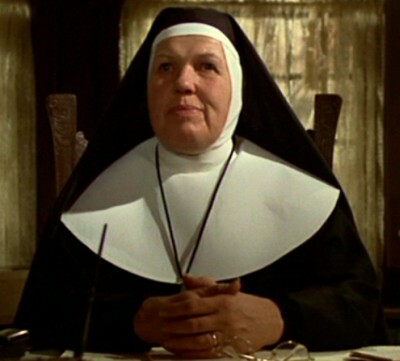 I travelled last week to the Mexican desert and had to leave his mother in the hands of my 3 midwives. Larry (the nodster) Moe (brother dog) and Curley (Dr. welby M.D.). The only good advice I could give them was to watch her – at least 2x a day – and if they saw any problems call the vet. I waited daily for a text (my only communication in the desert) and finally it came – “1 up!” – Great News! (but of course this also meant “1 down” but still under the circumstances this was good news!) Then another text and more good news! “Its a feemy!” (girl). So you can imagine my surprise when on my return I see that my “feemy” is actually a little billy! God Bless Senor Baja! I smiled – “Don’t take it personal,” I thought. She certainly had a way with words alright. No, I wouldn’t take it personal – life’s too damn short for that, (and the island too bledy small!) – besides, I just landed right on my feet, and it turned out my bad luck was really just someone else’s good luck! (I’ve taken that whole bad luck/good luck notion onboard after reading the “The Good Luck of Right Now”). But I sure hope the Penguin doesn’t “take it personal” either. Because the way I see it is, the Hotel getting a few cents less? – that just means someone else gets a few cents more! Sedona and Jerome were born today – Nov. 5th – Guy Fawkes Day (used to be one of the greatest holidays when we were kids – the one time of year we could buy pocket loads of fire crackers and light bon fires legal – man, talk about good clean fun!). 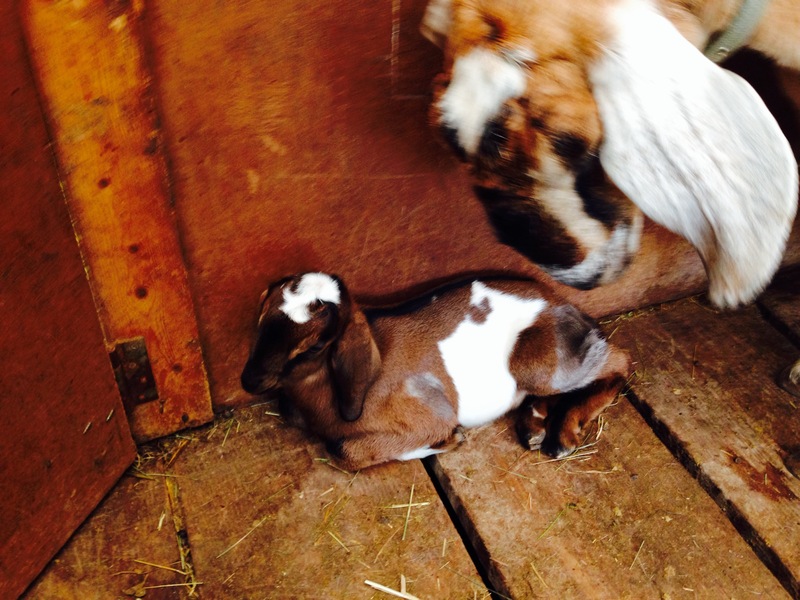 Yup, Just born a couple of hours ago in fact. Today also happens to be auspicious as it’s my son Kyle’s birthday as well – born 25 years ago today – ’89 – man, where does the time go? And so I had been pondering what to get him for a present (lie) it had to be something really meaningful you know? (another lie). And then just like right on cue – BOOM! – his birthday present(s) just “arrived” you might say! First Jerome (a buck, and a handsome devil), then a minute or two later, Sedona – (a red rock brownie). So, Happy Birthday times 2 my bie! And another thing – as crazy as it sounds, I just may let the horns grow on these two – it’s time. 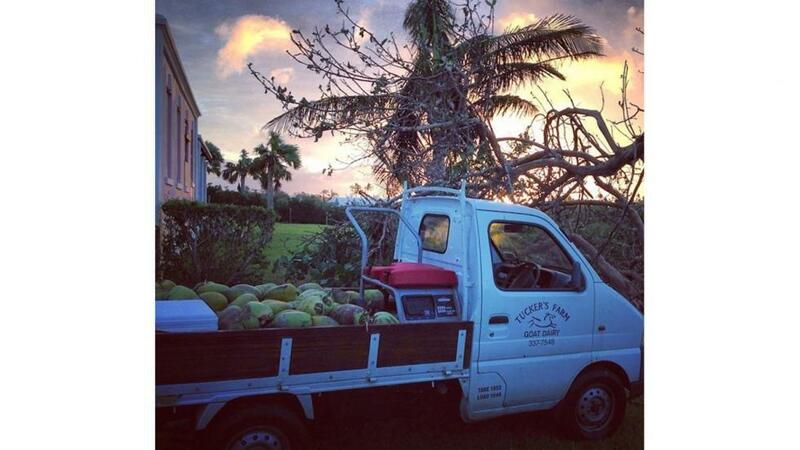 Bermuda has taken a serious hammering over the past six years – some might even say taken a “death blow”. Where the rest of the world proved resilient – we seemed to stay “stuck on stupid”. A two horse town, where one horse died and the other walked out in protest. And I did hear Craig Simmons the other night – but maybe the sentiment the “Rich are getting richer and the Poor poorer” is only half right, and the real problem is the Middle hasn’t held. “Here come the Entreprenuerials!! YaY!! !” (..and not a moment too soon!). So it could just as easily be that this sense of renewal I’m feeling is all in my mind – like I’ve hit that euphoric plateau, right before drowning. Or maybe, just maybe, that really IS the sunlight I’m seeing, dancing on the surface of the water above. 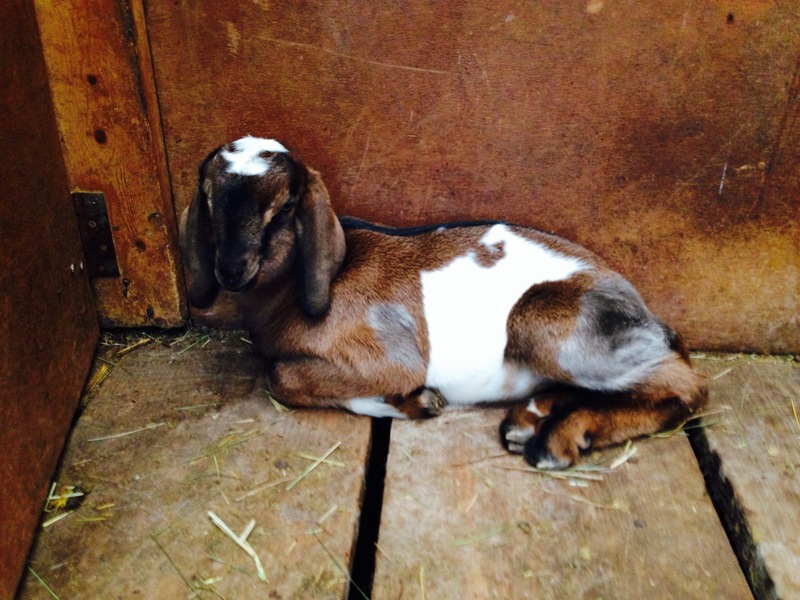 So I was asked the magic question again today – about my little goat cheese biz. He chuckles with a knowing smile and head nod. “Yah, – but without the optimism this time!” I say. 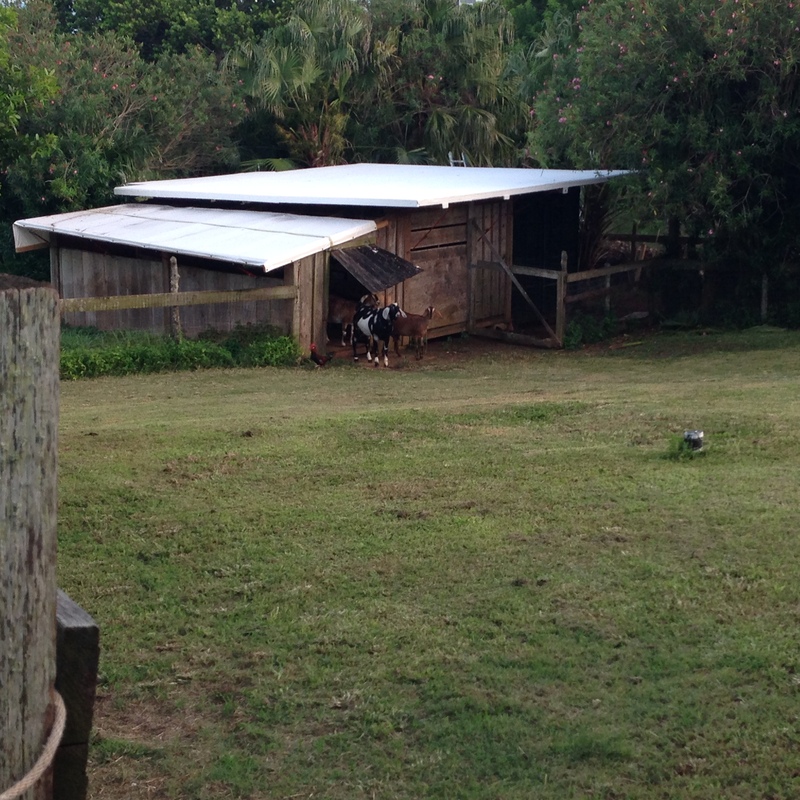 Well, who’d have ever guessed August would turn out to be such a terrible month to try to put on a new roof on the goat shed? Non-stop torrential rains, followed by hurricanes, hmmmmm. But still, dancing between the rain drops, somehow we did it. And it looks some sorta sporty, don’t ya think? Funny thing happened yesterday morning. True story! I hear a knock and I go out to find a very respectable young couple, all smiles, standing on the other side of my front door. 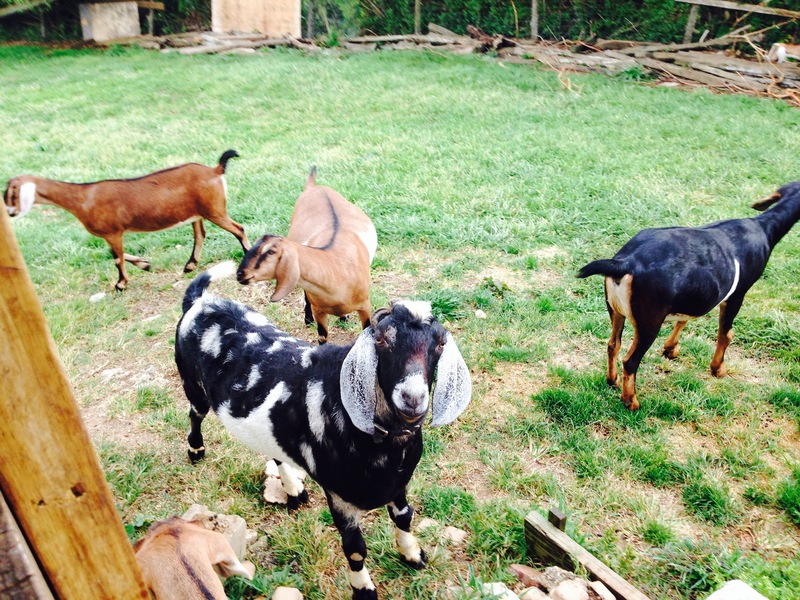 Now there are always friendly strangers making their way to my gates – usually to talk about cheese and goats – so I naturally beam a smile back and we trade “good mornings” in good local fashion. The young man begins to talk about cheese – but soon he springs it on me. Damn! They’re Jehovahs, playin’ “Gotcha!”. But you know what? That’s o.k. with me because I’ve never been accused of being a Christian and so I don’t really have a dog in that fight and I just carry on being as friendly as can be. And as they professed interest in the cheese and as I’m always ready to share, I say “Come on out and I’ll give you the nickel tour,” and we walk out to the dairy. While I’m showing them around, I notice a certain distraction has set in with the young man. He’s looking at something over my shoulder and telegraphing communication with his partner. Now she gets it too and they both seem distracted – uneasy even. Snap! 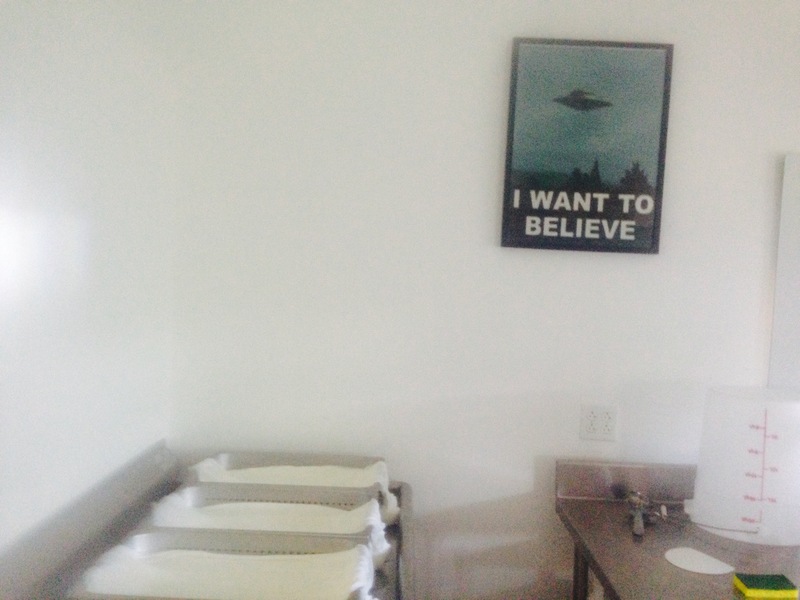 They’ve seen the only thing that adorns my walls out here – my “I WANT TO BELIEVE” poster and its messing with their heads big time! They’re starting to think its “crisscross” time and somehow they’ve been lured into the Devil’s Workshop itself! Visions of flying saucers filled with crazed cloven hooved creatures are dancing in their heads! “Well thank you much for the tour Mr. Tucker but we need to be pressing on this morning,” the young man says somewhat hurriedly, with his partner shaking her head in agreement. Mulder and Scully they aint – “Sure, sure, of course” I say. As I watch them walk back to their car I can almost hear him say to his partner “I think we’ll score this one for the Devil.” What a hoot!